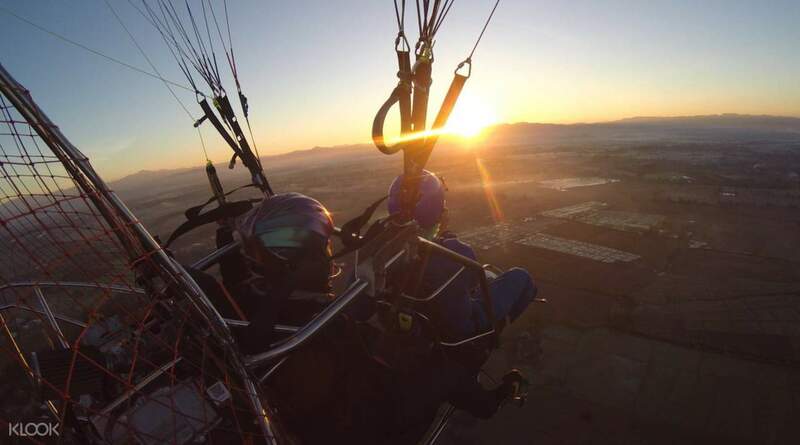 Don't miss the sunrise overlooking the gorgeous view of Chiang Mai in this 15 minute ride! What better way to unravel Chiang Mai's mystique than by flight as you get to know the little quaint town inside and out from heaven's view. 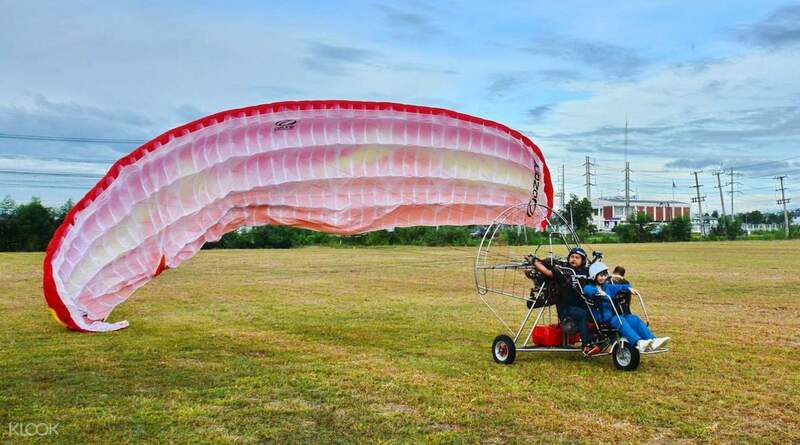 Paraplane flying – a mode of flight using a powered parachute – is one of Chiang Mai's exciting tourist activities it has to offer. Since this is a morning activity, a professional service team will pick you up at your hotel around 5:00am to 6:00am. Afterwards, a light breakfast will be served for all participants at 6:30am. By 7:00am, the tour operator will lead you to the activity's instructor and pilot. Get excited because you'll also be changing into paraplane gear around this time, too. Following the training, you're all set for the ride and you'll be floating in the sky at 7:15am. A ride lasts for about 15 minutes, just the right amount of time to witness the city's slow urbanisation while still maintaining its natural origins. You'll see all sorts of sightings from sacred temples to rivers and other extensive waters coming from the old city. Super fun experience!! You get to see the sunrise over the surrounding rice fields just outside of Chiang Mai city. The ride is super chill so you’re allowed to hold your phone/camera/GoPro on the ride. A must try experience in Chiang Mai! Super fun experience!! You get to see the sunrise over the surrounding rice fields just outside of Chiang Mai city. The ride is super chill so you’re allowed to hold your phone/camera/GoPro on the ride. A must try experience in Chiang Mai! 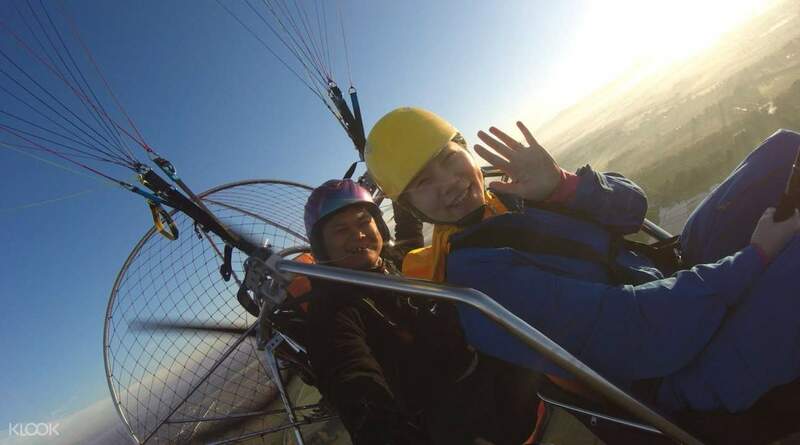 This experience is definitely one of the bucketlist because it was so fun to ride the paraplane. The pilot and operators was so kind to us. This experience is definitely one of the bucketlist because it was so fun to ride the paraplane. The pilot and operators was so kind to us. Wasn’t expecting such magnificent view when the driver drove us to the site. Although it was foggy, it starts to clear soon when we took off. Guided by an ex pilot for the journey, it was a “must do” activity in Chiang mai! Wasn’t expecting such magnificent view when the driver drove us to the site. Although it was foggy, it starts to clear soon when we took off. Guided by an ex pilot for the journey, it was a “must do” activity in Chiang mai! This is very safe event as a Thailand safety officer inspection all equipment and gave me instrution before flying. The moment flying on the sky made you feel a bird. Looking dowm you can see the beautful field, houses and temple. You even fly higher than birds. It is MUST even when visiting Chiang Mai. This is very safe event as a Thailand safety officer inspection all equipment and gave me instrution before flying. The moment flying on the sky made you feel a bird. Looking dowm you can see the beautful field, houses and temple. You even fly higher than birds. It is MUST even when visiting Chiang Mai. I really enjoyed the paraplane ride. Very cool experience and very friendly people. It's definitely worth it. However, little breakfast choice and too much plastic - like everywhere in Thailand. I really enjoyed the paraplane ride. Very cool experience and very friendly people. It's definitely worth it. However, little breakfast choice and too much plastic - like everywhere in Thailand. I just love the experience of seeing chiang mai above, the staffs are very accomodating even if I was the only guest that time. The one who picked me up arrived on time in the lobby of my hotel. I readied myself for heart dropping moments but it was a smooth ride and purely awesome experience. Will be giving 5 stars, it's worth my money and if I'll have a chance to go back in chiang mai I'll definitely do paraplane again with them. I just love the experience of seeing chiang mai above, the staffs are very accomodating even if I was the only guest that time. The one who picked me up arrived on time in the lobby of my hotel. I readied myself for heart dropping moments but it was a smooth ride and purely awesome experience. Will be giving 5 stars, it's worth my money and if I'll have a chance to go back in chiang mai I'll definitely do paraplane again with them. That's an amazing experience. It is foggy but the weather is not so hot for this month. The tour operator contacted us 2 days earlier to double confirm the pickup time and collect information for insurance, which is good. Highly recommended! That's an amazing experience. It is foggy but the weather is not so hot for this month. The tour operator contacted us 2 days earlier to double confirm the pickup time and collect information for insurance, which is good. Highly recommended! Very safe flying experience. The driver talked about the ChiangMai culture while driving us to the venue. After arrival, snacks and drinks were provided as refreshments. Professional tutor guided us to put on the safety customes. Sightseeing the cute country in a brand new angle was really an unforgettable experience. Very safe flying experience. The driver talked about the ChiangMai culture while driving us to the venue. After arrival, snacks and drinks were provided as refreshments. Professional tutor guided us to put on the safety customes. Sightseeing the cute country in a brand new angle was really an unforgettable experience.